Ok, not much of a photo there and those of you who follow the daily food diary will have seen these all before. This is basically a recreation of an old childhood junk food favourite of mine and one I have been trying to get right for a long time. 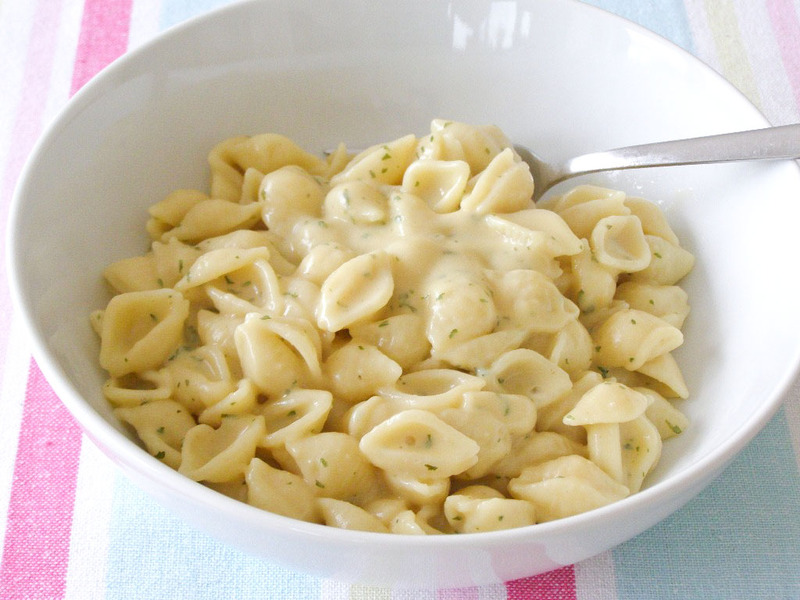 Growing up I used to love these 'Creamy Garlic Shells' that were by Lipton and sold as part of the 'Sides' range. 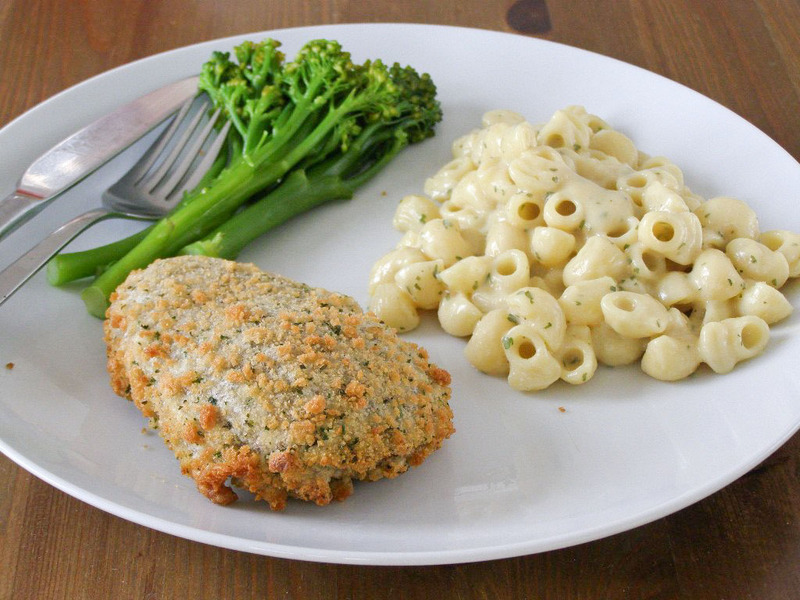 The idea being you serve this pasta on the side of some meat item and some veg. 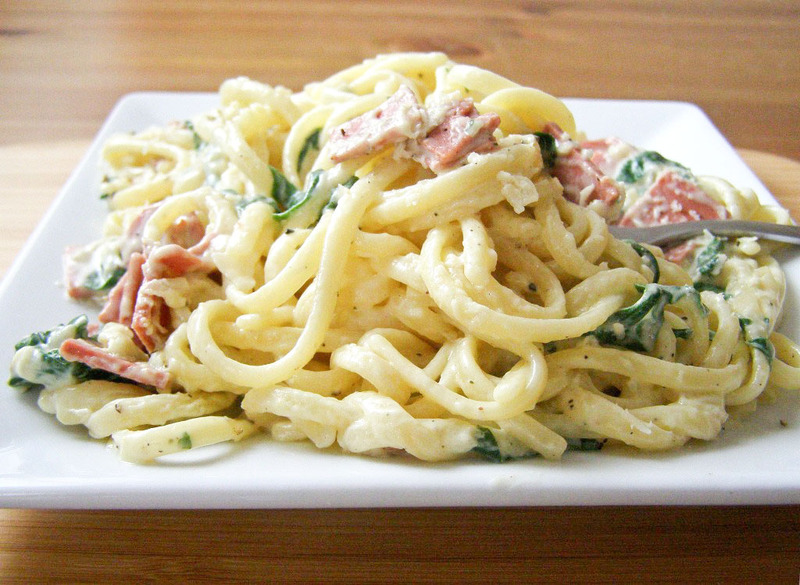 I loved it so much though I would often just have a big bowl of the pasta on it's own. Most Canadians would probably site Kraft dinner as their favourite "guilty pleasure" boxed pasta dish but for me it was this stuff, I couldn't get enough of it. It was basically shells in a creamy white cheese sauce, the cheese being powdered parmesan and romano, I know, sounds gross but I really loved it!! I've made several attempts to veganize it, first with cheezly in a roux which wasn't even close, then I omitted the cheese altogether and simply made a roux with vegan milk and a Kallo Garlic and Herb stock cube thrown in and that was pretty darn close. I was happy with that. But then Chloe Coscarelli's Mac and Cheese recipe came into my life. It's easily the best vegan mac and cheese I've tried and I have stopped even trying other nutritional yeast based ones altogether because of it. 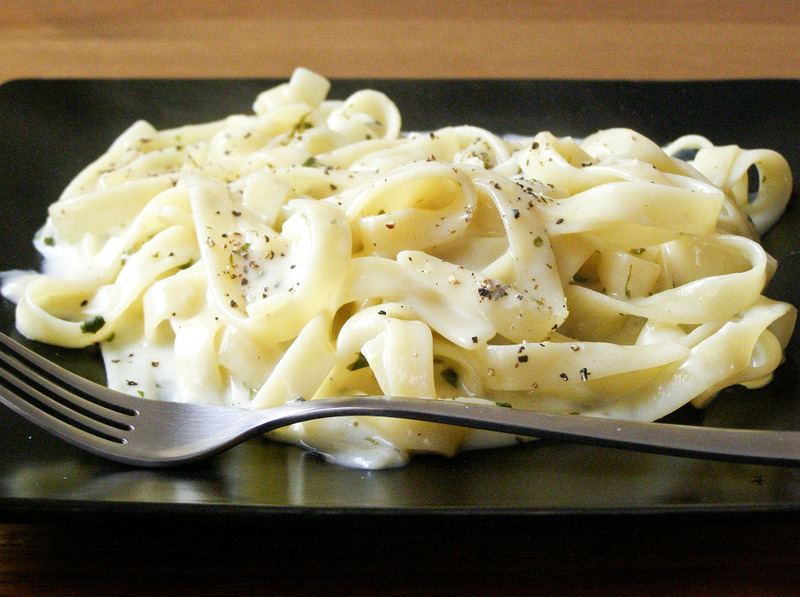 Then it dawned on me that I never tried to make this pasta using nutritional yeast to mimic the cheesy sauce. D'oh! Then we had it with traditional macaroni on the side of a store bought disgusting vegan kiev and some tenderstem broccoli. If the kiev wasn't yucky this would have really worked! 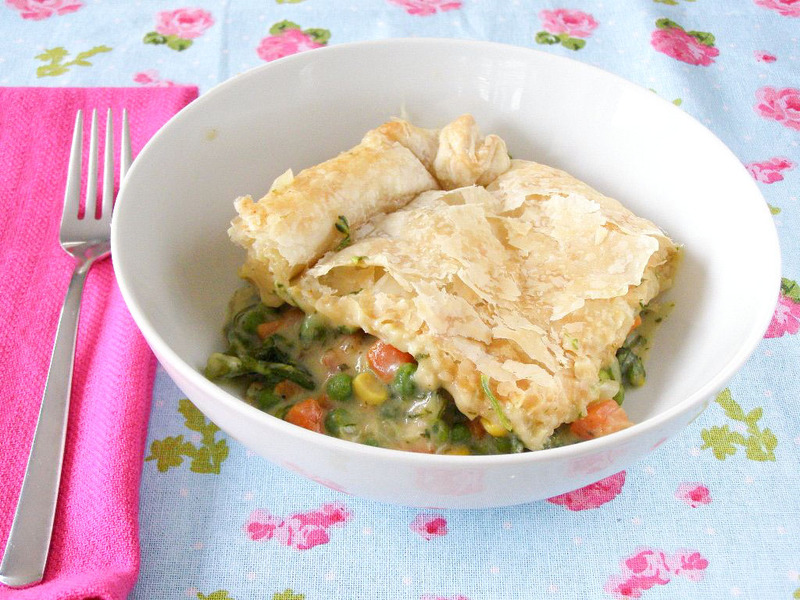 It also works perfectly as a creamy sauce in a vegetable pot pie! This turned out so well I've since updated my last Creamy Vegetable Pot Pie recipe with it - just click on the link there for the recipe. Gorgeous! 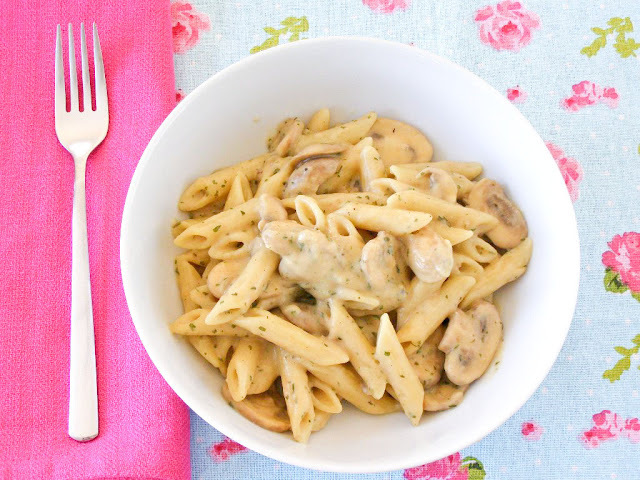 I further made a variation on this recipe - Creamy Garlic Mushroom Penne - this was beautiful, I've been after a good creamy mushroom sauce for a while now and this is it! 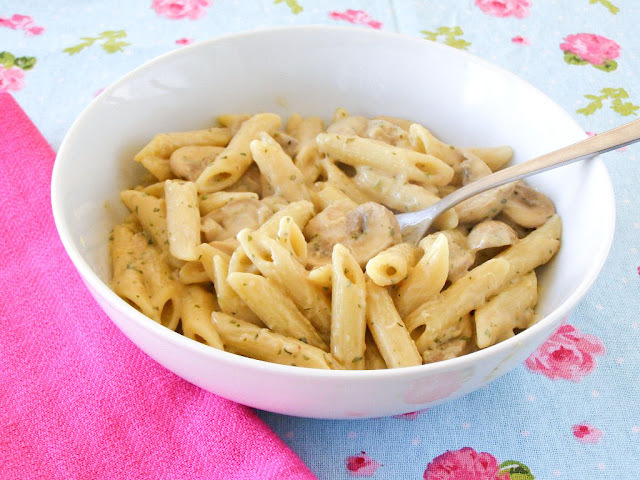 I've added sliced mushrooms and replaced the salt with a mushroom stock cube for extra mushroom flavour. Beautiful. Recipe below! Now, this is usually a traditional roux sauce where you melt the butter then add the flour and stir for 1 minute then slowly start adding the milk mixed with the yeast, salt, garlic powder and parsley, stirring well after each addition then simmering until thick. 1/4 cup nutritional yeast flakes, ground to a fine powder in a mortar and pestle. 1 tsp EACH salt, garlic powder, parsley, lemon juice and light agave syrup - I've also used Sweet Freedom syrup instead of the agave and it was perfect. Meanwhile make the sauce: In a pyrex jug measure out the milk then add the yeast, salt, garlic powder and parsley and whisk well. (I hold the whisk between both hands and rub back and forth) Pour this into a saucepan and add the butter and sprinkle over the flour. Turn the heat onto high and whisk until the flour dissolves then just whisk now and again while the butter melts. 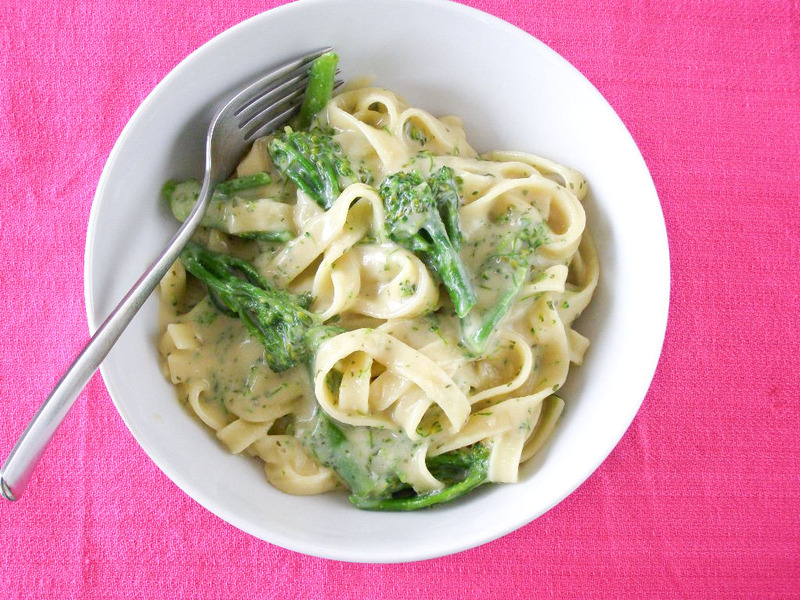 As it comes to a simmer and it looks smooth switch from a whisk to a wooden spoon and simply stir now and again until thick and creamy. It's a lot easier! Turn off the heat then stir in the lemon juice and agave and pour over the cooked drained pasta and stir over low heat for a couple of minutes until the pasta is well coated with sauce. 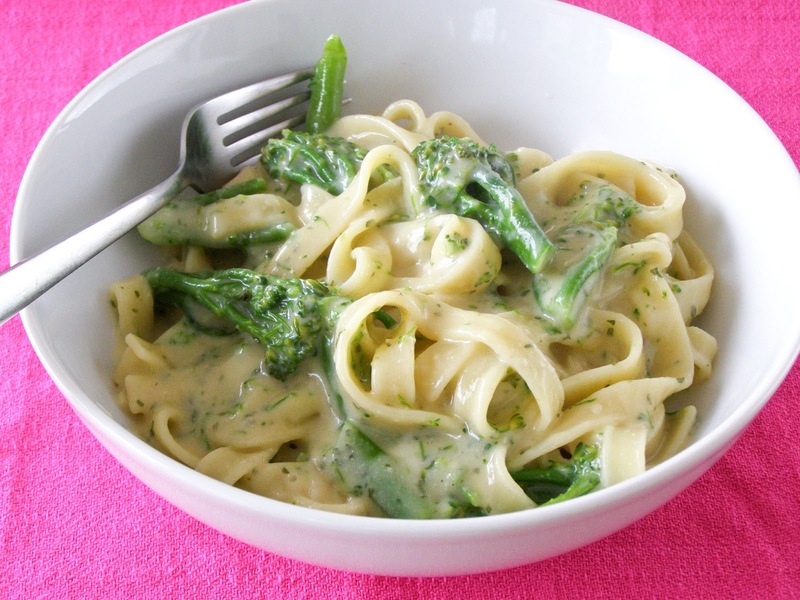 While it's great on it's own this can take a lot of veg added: broccoli like I did, asparagus would be nice, as would peas - whatever you like really! Source: Very much based on Chloe Coscarelli's Mac and Cheese. 1 tsp EACH garlic powder, parsley, lemon juice and light agave syrup - I've also used Sweet Freedom syrup instead of the agave and it was perfect. Meanwhile make the sauce: In a small saucepan measure out the milk then add the yeast, stock cube, garlic powder and parsley and stir. Turn the heat onto low and heat whilst stirring just until the stock cube is dissolved and mixed in. In a large saucepan add the butter, turn the heat to high and when melted add the mushrooms. Fry until the mushrooms are well coated in butter then add a small pinch of sea salt and a few grinds of black pepper. Keep frying until the start to wilt then reduce the heat to low to let them sweat. When almost all the liquid has evaporated but there is still some there add the flour and fry on low for about a minute. Now slowly start adding the warmed milk mixture, a little at a time and beat well with a wooden spoon until smooth after each addition. When all the milk has been added turn the heat up to high and keep stirring until thick and creamy. Now stir in the lemon juice and agave then add the well drained penne and stir until very well coated in sauce. Serve immediately! I pretty much gave up on the noochy mac n cheese recipes, but if this is as good as you say it is (and make it look), I may have to give it another shot! It looks so decadently creamy. Wow, all of that food looks perfect. Chloe's book's been on my wish list for a while now but I think your post's pushed me over the edge & I'll be buying it shortly. Congratulations on the Women's Food Blogger award, that's awesome & I'm loving the new layout...no Comic Sans in sight! !